Welcome to the Math Salamanders Practice Times Tables Worksheets for the 10 Times Table. Here you will find a selection of free printable Math worksheets, which will help your child to learn their 10 times table. Here you will find a selection of practice times tables worksheets designed to help your child to learn and practice their 10 times tables. 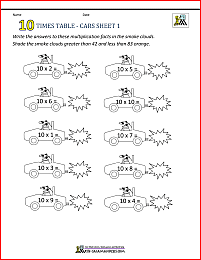 learn their division facts for the 10 times tables. 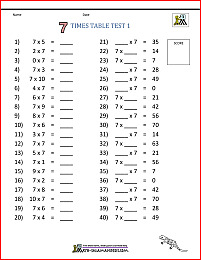 All the free practice Times Tables sheets in this section support the Elementary Math Benchmarks. 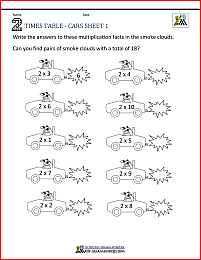 Looking for more 10 Times Tables worksheets like these? 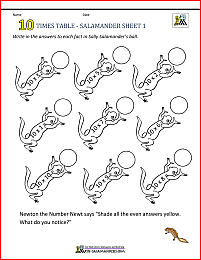 Try the 10 Times Table practice worksheets at the 2nd Grade Math Salamanders! The sheets on this site are great for introducing the 10 times table with counting and grouping activities. Here you will find a selection of individual math times tables sheets designed to help you practice a particular times table. All the free math sheets in this section support by the Elementary Math Benchmarks.